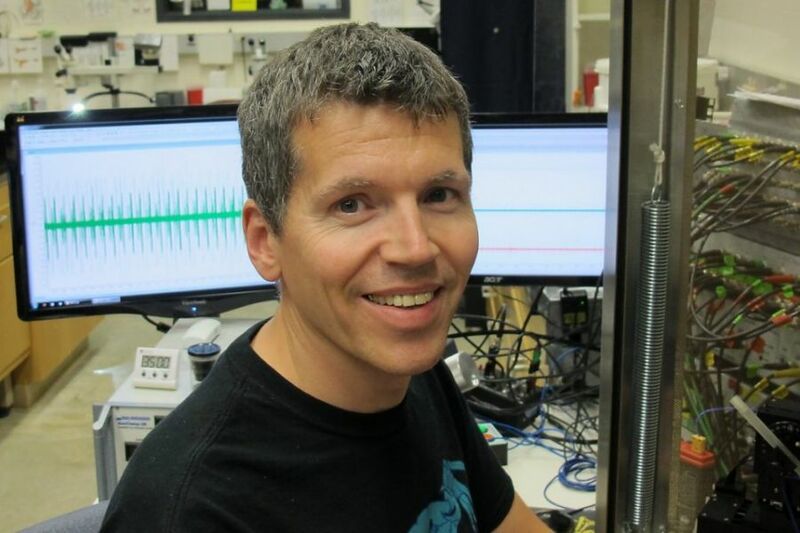 Illinois State University’s Associate Professor of Neurophysiology Wolfgang Stein received a $495,000 grant from the National Science Foundation (NSF) to examine how changes in temperature can impact the nervous system. While the human nervous system is not prepared for drastic temperature changes, some animals are. Stein and his team have examined the way one type of crab, Cancer borealis, regulates temperature change. “They are happy quickly moving between 5 degrees Celsius (41 F) and 25 degrees Celsius (77 F), which is almost impossible by human standards,” said Stein, whose lab has been honored with several NSF grants. He suspects crabs release a substance that “rescues” the animal from a sudden change in temperature. “When the temperature goes up, neurons become more ‘leaky,’ or the electrical current that sends messages slips out of little holes in the membranes,” said Stein. “As electricity leaks out of the neurons, they cannot produce their typical electrical activity and essentially just become silent.” Stein and his team of students have found that a peptide in crabs—or chain of amino acids found in the neurons—can “plug” the leaky holes, allowing crabs to withstand a greater variation of temperatures. The NSF grant will support current and new students in Stein’s lab to conduct a comparative study exploring if other species experience the same rescue mechanism. Stein currently plans on using four types of crabs and crayfish in the study: the Cancer borealis crab that comes from the Atlantic Ocean and lives in deep, cold water; the Cancer productus crab from the Pacific Ocean and also lives deep, cold water; the Carcinus maenas, an ocean crab that lives in shallow waters with variable temperatures; and the Procambarus virginalis, a fresh water marbled crayfish that can live in variable temperatures. “There are millions of years of evolution separating these crabs, and it will be interesting to see if the temperature mechanism is something that has persisted in evolution,” said Stein. Learn more about Stein’s lab with the Twitter handle @WeAreTheCrabLab, or on the lab’s Facebook page.